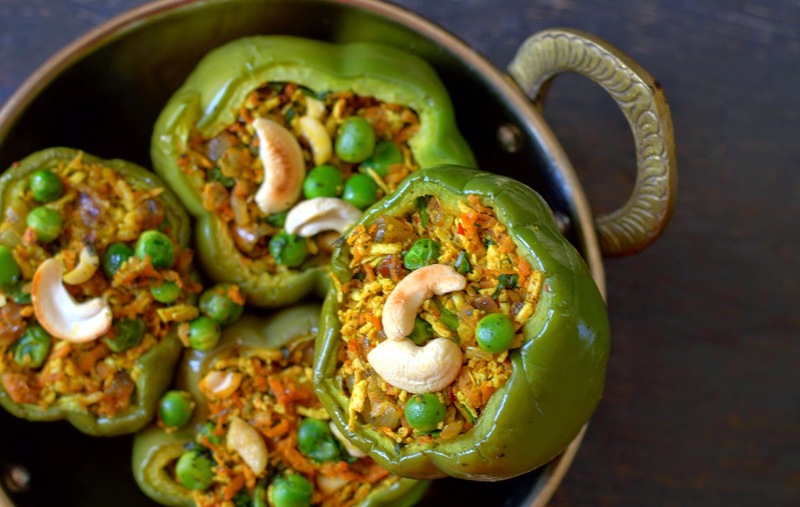 Cakes & More: Cashew & Tofu Stuffed Peppers - More Desi Health Bites! Cashew & Tofu Stuffed Peppers - More Desi Health Bites! 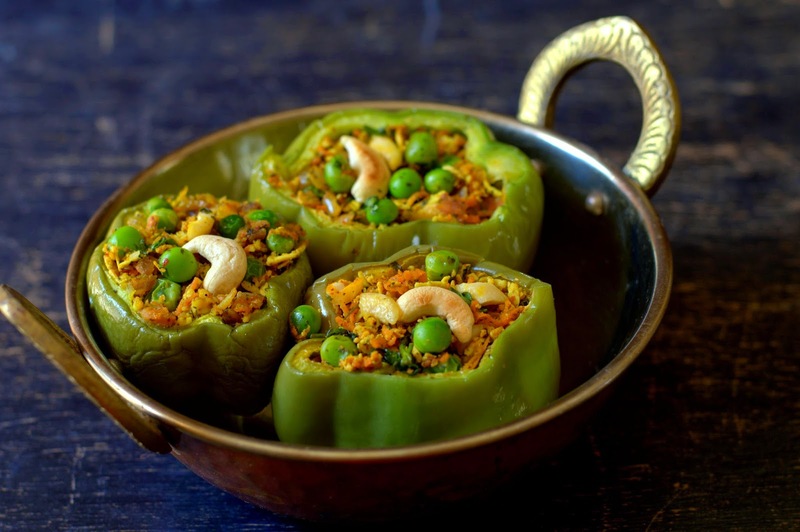 Stuffed capsicum or stuffed bell peppers is a very popular dish in India and many versions abound. This ever-present potato stuffed version on the menu of restaurants serving North Indian Cuisine and the rich Hyderabadi version. Then the North Karnataka style with a lip smacking garlicky gravy and then some more! Here comes another slightly healthier version, Cashew And Tofu Stuffed Peppers. Bell peppers stuffed with a tasty mixture of tofu, crunchy roasted cashews, vegetables and spices. The peppers are then baked in an oven till done. This post comes as the next and final recipe in association with Fortune Foods. Rice bran oil apparently has the right balance of SFA, MUFA and PUFA nearest to the recommendation by WHO. Oryzanol is one of the micro nutrients, which is extremely heart friendly. It reduces overall cholesterol absorption from foods, slows down cholesterol formation inside the body, selectively reduces the bad cholesterol (LDL) and improves good cholesterol. Apparently, research has shown that sufficient Oryzanol is received when FRBH is consumed at normal levels. Addressing the myth that rice bran oil can't be consumed during fasts, it is made from the bran of rice, a nutritious brown layer between the grain and husk. Bran is the only source of Oryzanol, which helps reduce cholesterol and prevents heart disease. And I am glad this is one of the oils I have been using regularly in my cooking and baking! Green Bell Peppers - 4 medium sized. Method : Wash and dry the bell peppers. Slice off the tops, remove the seeds. If needed, slice a tiny layer horizontally at the bottom so that they stand upright as they cook. Heat 2 tablespoons oil in a pan. Tip in the onion, saute till it turns translucent. Then add the ginger garlic paste, saute for a couple of minutes. Next, add the turmeric and chilli powder. Saute. Mix in the the rest of the ingredients. Cook on low heat for a couple of minutes. Let cool and stuff the bell peppers with the mixture.